I've just spent the past weekend in Brighton, enjoying the glorious last rays of summer. We went to celebrate my birthday (AHEM IT'S TODAY!) and as anyone who knows me might be able to tell you, I rarely go anywhere without planning somewhere decent to eat. With 8 people on a Friday night after a long week at work, I wasn't about to leave it up to spontaneity or chance. That way lies hanger. The Chilli Pickle sits in a square opposite Wagamama and Pizza Express which doesn't bode enormously well, and once inside it's dark and noisy, lit with neon. But the smell inside is enticing and we sat down beside shelves of tiffin boxes and jars of pickle, of which they're famous for. The menu is large (this online one is out of date), made even larger by a separate set menu sheet and the drinks list is even larger, listing beers from India, America and Germany, as well as our own home-grown. 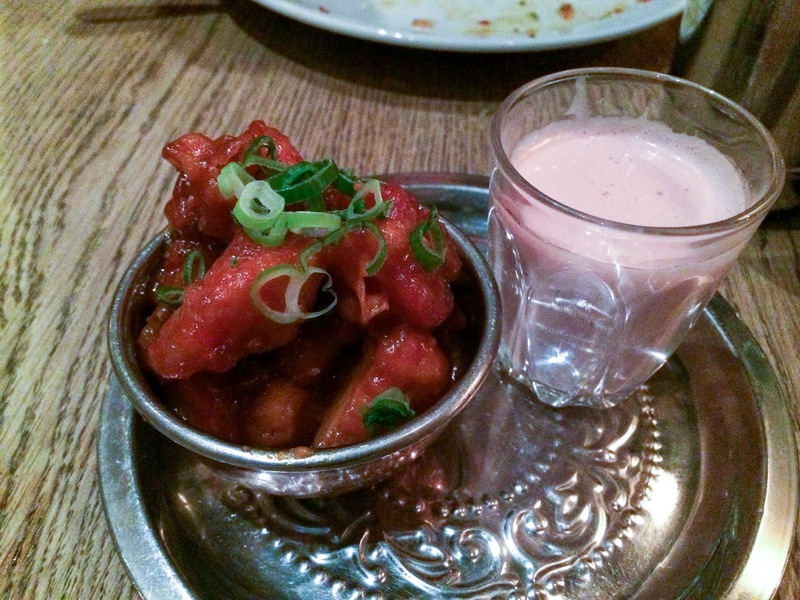 We snacked on poppadoms and an excellent range of pickles while we decided what to order. 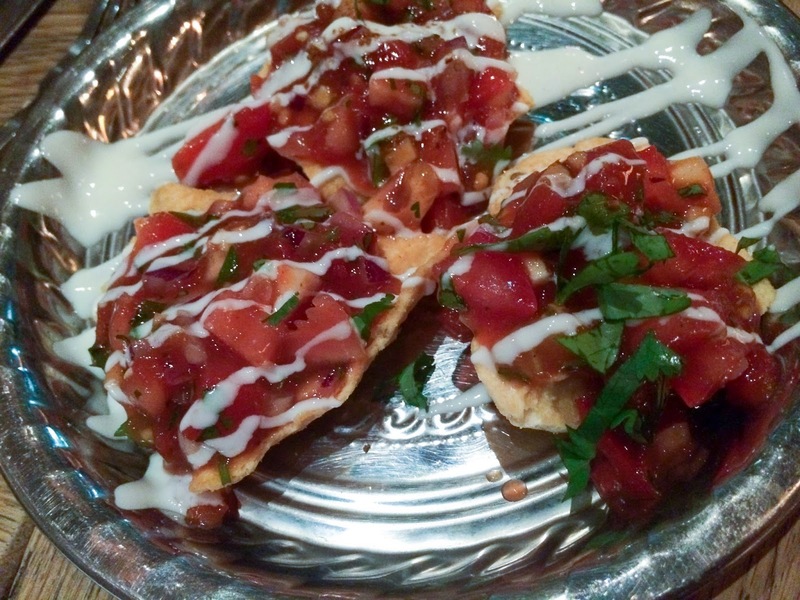 Namkeen chaat were salt crackers topped with a tomato relish, strong and spicy in ginger. Messy to eat, they were palate-cleansing and punchy. 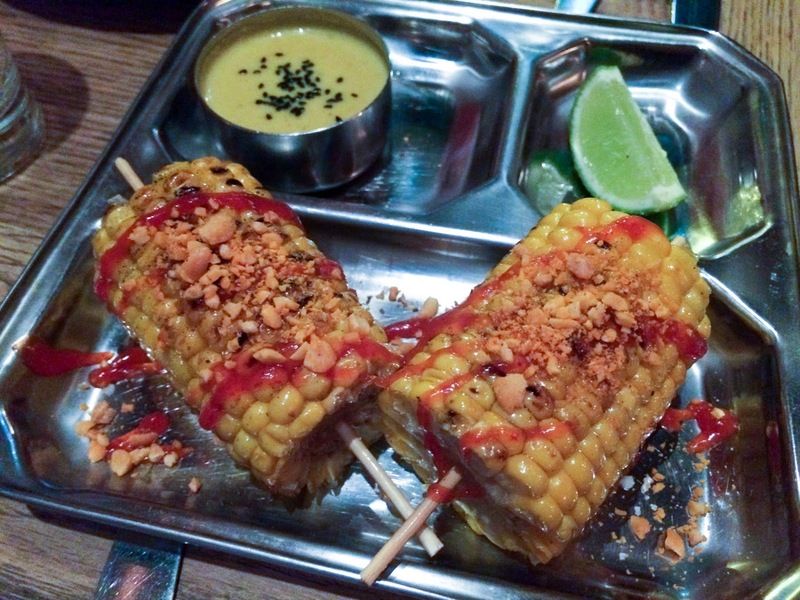 We decided to order a bunch of things to share, which I immediately regretted upon tasting this corn on the cob. They were seriously good; steamed and coated with a little chilli sauce and crushed peanuts. The dish of yellow sauce you see at the back there was coconutty and creamy, and when we asked, were told it's like a korma but without the nuts. We poured that stuff directly into our mouths. 'Manchurian' is a style of Chinese cooking adapted to Indian tastes, so basically deep fried and tossed in a sweet and sour but spiced sauce. In this case it was applied to the blandest of vegetables - the cauliflower. Underneath the crisp casing was merely matter to fill, and the pink yoghurt dip reminded me of strawberry Yazoo. Not that it tasted of much, mind you. I left this one to the group. We were back on track with the Chennai skate fry. 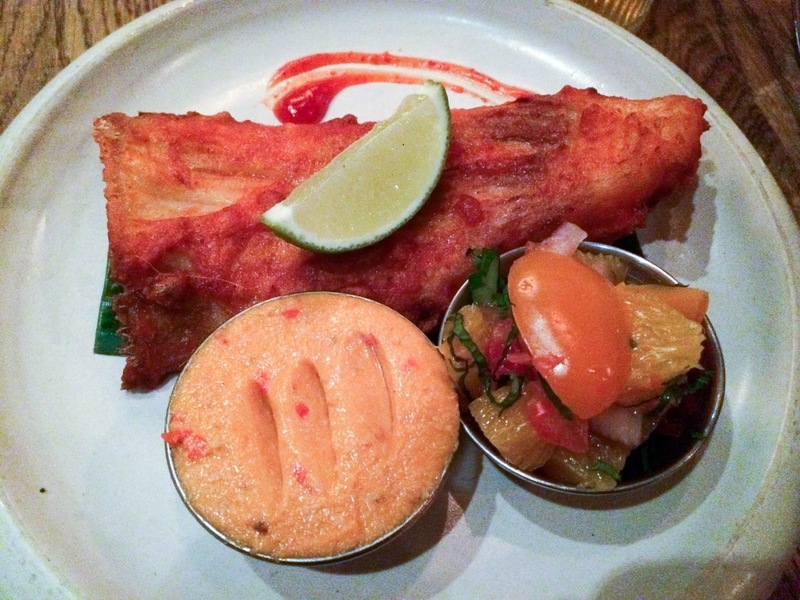 The piece of skate wing was dusted in spiced, seasoned flour and fried until crisp, so that when you pulled the flesh back from the cartilage you get both soft meat and a crisp contrast. I loved this, especially slathered with the coconut sambal and chased with the tomato and grapefruit salad. Luckily so, as another two portions turned up by mistake. 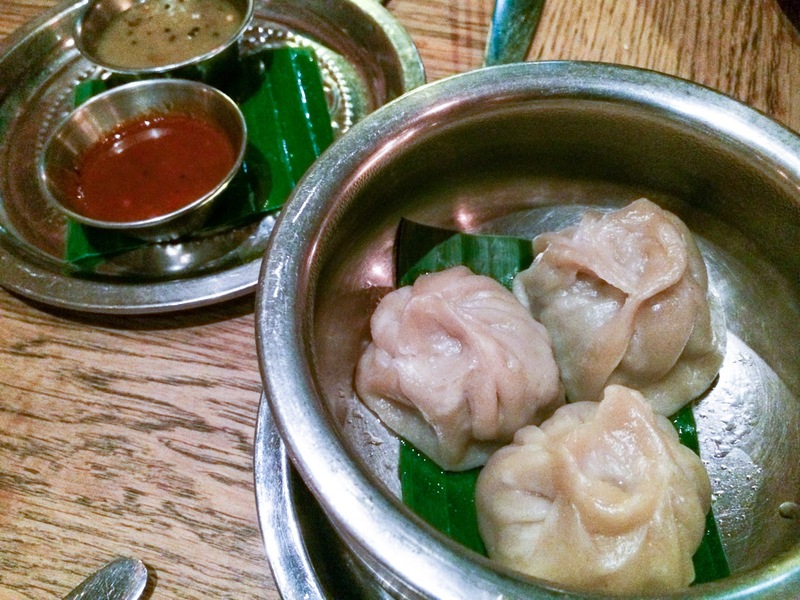 I love dumplings, so I had to order the Nepalese pork momos, even though they seemed incongruous on a menu like this. They were quite thick skinned, the filling bland, but helped along by the tomato sambal and a fruity sauce flavoured with apple. It soon became clear that the mains at The Chilli Pickle aren't intended to be shared. Each of them arrived on its own tray, with all the requirements of a complete meal around it, which struck me as a slight shame, since what I love most about Indian food is a selection of dishes. 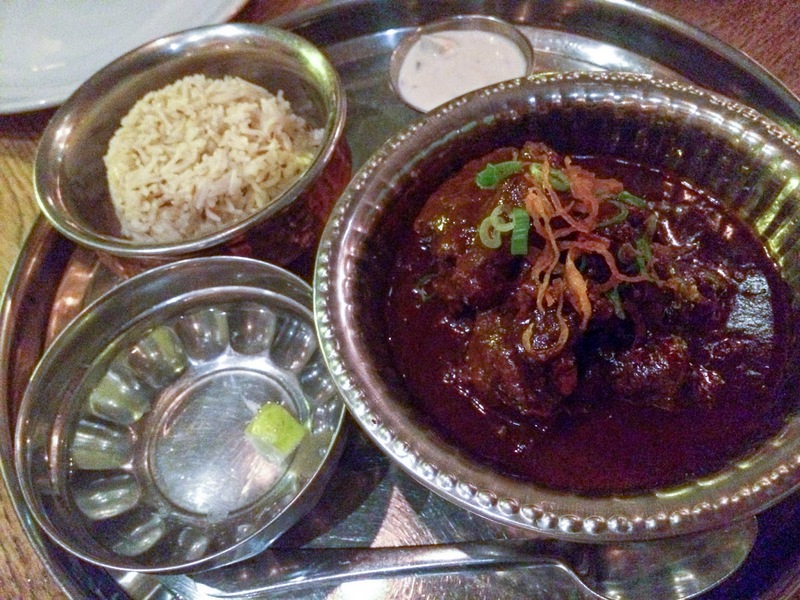 In particular the oxtail madras; while it was well spiced, with great flavour from the gravy - which would also explain why it is their permanent 'special' - it is also incredibly rich, and after a mouthful or two we'd pass the dish down. The chunks of oxtail meat pulled away from the bone easily, but for a dish with three chillis which was the maximum heat rating, it lacked punch. 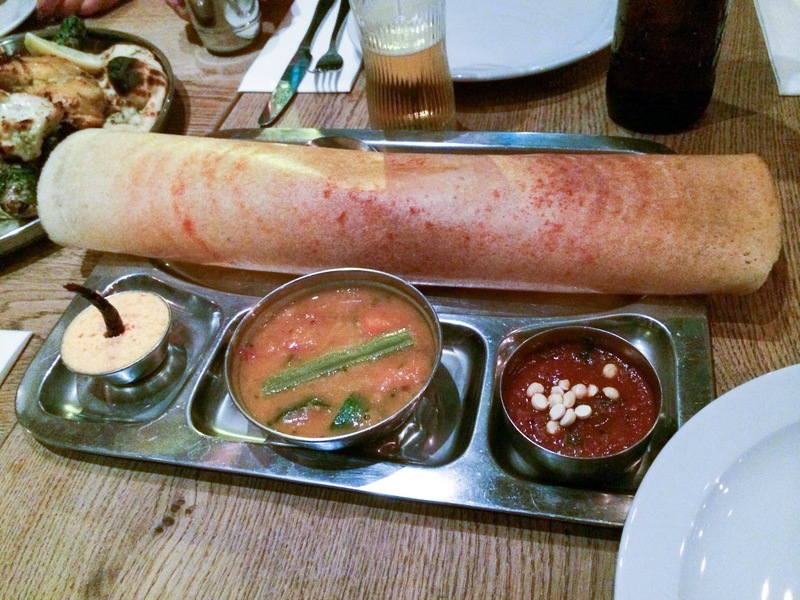 I loved the Mysore malasa dosa. A large thin pancake made with rice flour is wrapped around potato curry, mild and creamy, scented with curry leaves. The accompanying vegetable curry had chunks of courgette in, and the red coconut sambal had a bit of a kick to it. 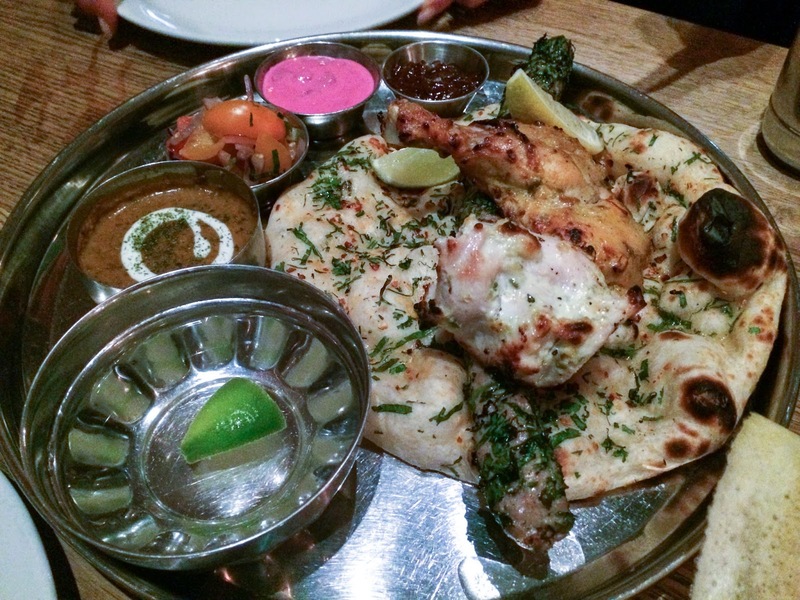 The chicken tandoori platter lacked the charcoal whiff of the tandoor, but made up for it with a very herby chicken keema kebab, scented with cardamom. The naan beneath it soaked up all the chicken juices, and was perfect for dipping in the buttery black dhal. There's that tomato salad again. 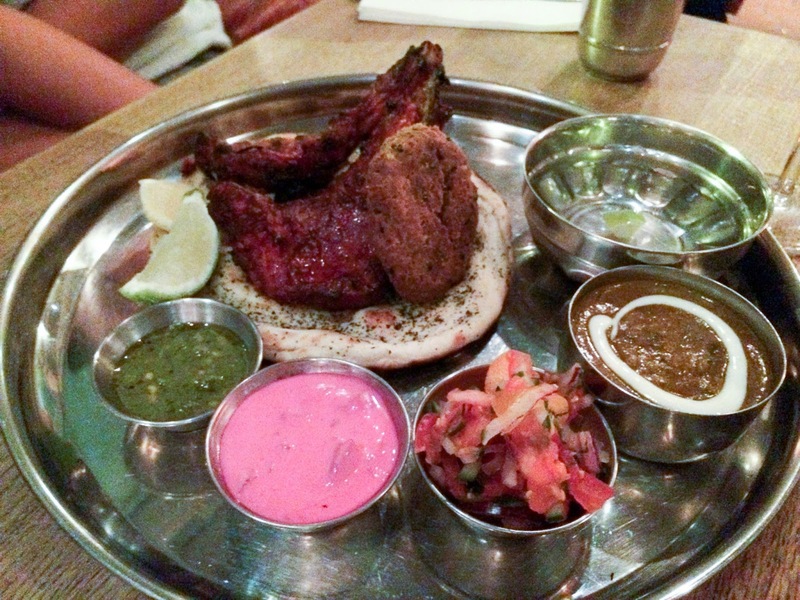 Tandoori lamb chops were tender and succulent, though they'd need a stronger hand with the spicing, and much crisper and abundant fat to give Tayyabs a run for their money. I really liked the green chilli and mint chutney that came with it, and the lurid pink beetroot raita was soothing, yet surprisingly spicy. I have no idea what the round puck was - it didn't look particularly appealing, and instead I got on with dipping our extra garlic naan in the dhal of the day, a yellow lentil tarka. So, a meal of ups and downs, but mostly ups. I like that the menu ranges widely from very obvious South Indian style, touching upon Gujarati, and a brief pause in Nepalese. It did make it a bit awkward when our visibly uncomfortable waitress couldn't tell us what the difference between kesar, pasanda and rajput gravy were, nor could she explain much else on the menu. Our numerous grievances with the service, such as more beers than we'd ordered turning up, our poppadom order doubled, and a starter tripled were put down to the training status of our waitress, so it seems mean to call them up on it, but I wonder about the wisdom of assigning a server in training to a table of 8, with a potentially complicated order on a busy Friday night. Maybe I'm mean. There's obvious skill in the kitchen though and with plenty of booze and more food than we could fit in, we paid £32 each including service. I love the Chilli Pickle! They do awesome tiffin boxes for take aways with a ton of delicious chutneys and side dishes.